My husband and I were walking through Greenway Park / Springbank Park in London, Ontario, watching for Bald Eagles. A woman was standing on the path looking at something just off the path, she walked away but kept looking back and smiling. 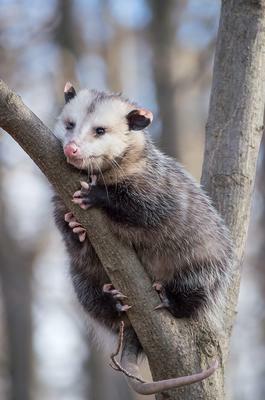 So of course we stopped to look and here was a possum about 10 feet off the ground on the branch of a tree. I am a photographer so of course I had my camera with me! 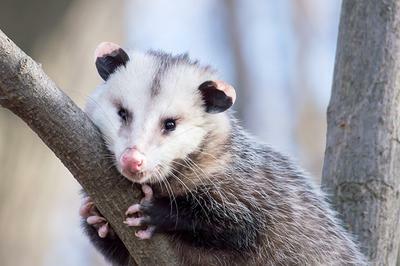 Thank you for telling us about your Possum sighting, and for sending these great pictures, I know our readers will love them! I have seen Bald Eagles on the banks of the Thames, close to Springbank Park, so if you see any, please let us know. Comments for Possum in London! Saw one on back deck near cemetery, St Peter's, Barker Street, October 6 2018.